Whether supplying a new replacement flare or a refurbished / remanufactured Flare, Argo Flares often recommend various optional upgrades in order to achieve an extended service life of a flare. Materials used for flare manufacture have traditionally been CS, 316L, 800H, DS, 310, 309, 625 etc. These all have good redeeming features but also weaknesses. Fine tuning material selection along with detail changes, can add years to life expectancy. Checking your current process operating conditions, along with any future requirements, against the historical design date and if necessary reworking your flare design parameters to suit. Undertake a thorough NDT program on the material to be retained. All regions are 100% visual, 100% DPI and a level of radiography is agreed with the client (usually matching that of the original design). Looking at the failed regions and making design changes to the problematic areas. 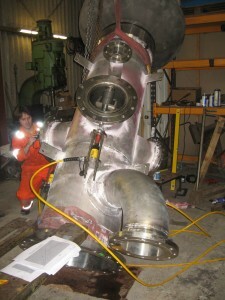 This could be material upgrades and changes in weld details and replacing cast for wrought materials where beneficial. Paying careful attention to the pilot and ignition system.